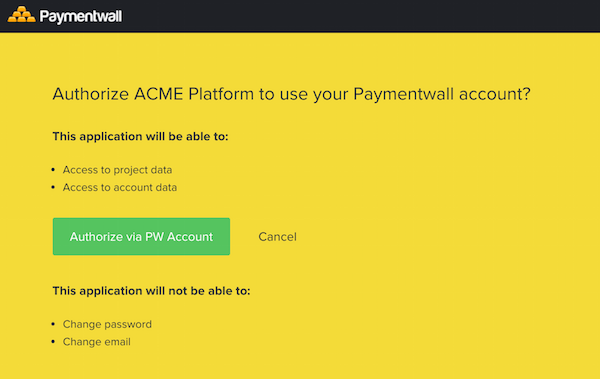 On a page at your website you include Paymentwall’s “Authorize via PW Account” button with your custom client_id which tracks the user’s click. On Paymentwall’s website, the user can approve access to their account. Once user approves access to their account they will be redirected back to your website (based on redirect_uri param) with code parameter. Then, make a request to Paymentwall Oauth 2.0 server with that code. You will receive the access_token. client_id 246921bdb35e8de871c206f8710b6c4d Your platform identification. Generated by Paymentwall. You can get it after registration as Platform. redirect_uri https://example.com/oauth/paymentwall Your Oauth landing page. scope pwaccount.email.get,merchant.application.get,merchant.application.update,merchant.application.create Your requested scope. state 206c80413b9a96c1312cc346b7d2517b84463edd Some random string for prevent CSRF attacks. Will be returned back with code to your Oauth landing page. Showing the button. This will redirect the user to Paymentwall's authorization page. Once user clicks on Paymentwall’s “Authorize via PW Account” Button. They will be redirected to Paymentwall approval page or alternatively to a login page. Once the user approves access to their account, we redirect them back to your site with authorize code based on your redirect_uri which was in first step. https://example.com/oauth/paymentwall redirect URL URL, which was declared at first step. code=0b422057958e163c8e9b00569b05982548d44157 authorize code Random generated by Paymentwall code, which allow get access_token (fourth step). Once you receive code parameter you ready to request access_token. code Code, that you receive, at third step. client_id Your platform identification. Generated by Paymentwall. You can get it after registration as Platform. client_secret You secret key. Generated by Paymentwall. You can get it after registration as Platform. redirect_uri Same uri, as it was at first step. 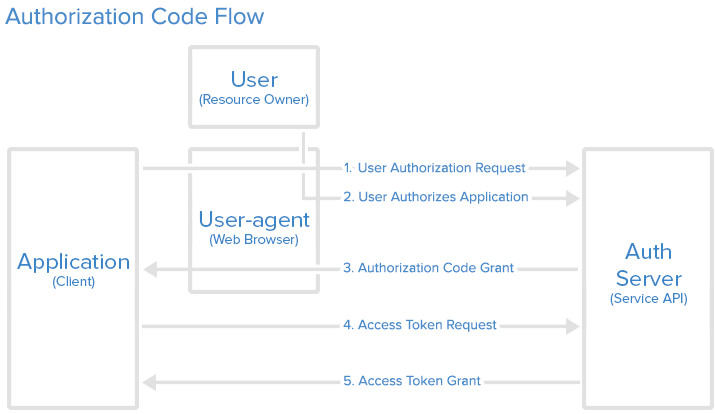 access_token Your "key" to API requests. expires_in Count of seconds to token expire. Once you get access_token you are ready to use Paymentwall API and manipulate with end-user accounts. PWAccount is a like main hub. Merchant, user, advertiser and other types of accounts based on PWAccount (Paymentwall Account). pinback_url https://example.com/paymentwall/pingback To learn more about integrating Pingbacks, refer to the Getting Started page. vendor_settings[commission_base] net ‘net’ is by default for now. Take your commission after payment system fees are deducted.